The largest scientific project in the Middle East, the SESAME synchrotron radiation facility, was officially unveiled in May 2017. Located in Allan, Jordan, SESAME is made up by physicists from several countries that rarely talk to one another – Cyprus, Egypt, Iran, Israel, Jordan, Turkey, Pakistan and Palestine – but whose scientists are determined to collaborate. And colleagues from Germany, France, Italy, UK, Sweden and Spain are supplying expertise, equipment and technical support. 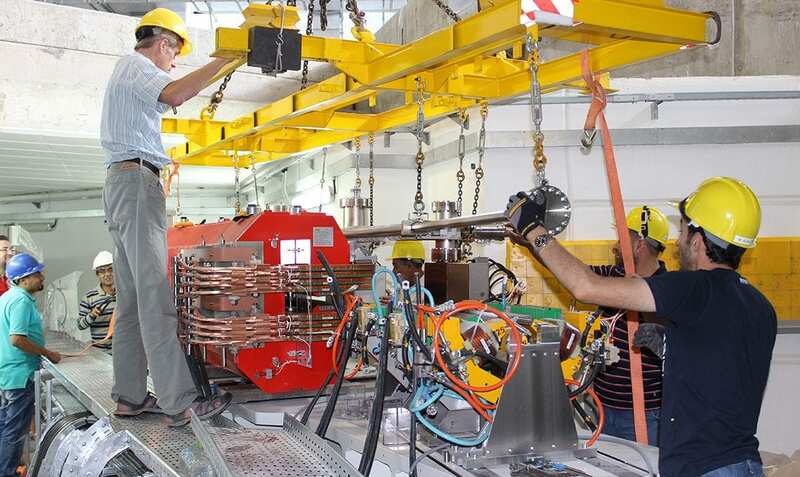 Chosen for its resonance in the region’s culture, the name SESAME now works as an acronym for Synchrotron-light for Experimental Science and Applications in the Middle East. The heart of the new facility is a particle accelerator, known as a synchrotron, speeding electrons around to make them emit powerful beams of radiation – so-called synchrotron light – that can be used to study the properties of materials ranging from exotic semiconductors to viruses. Applications will include: developing new materials, probing the structure of DNA, penetrating the secrets of chemical compounds, designing pharmaceuticals, performing disease infrared imaging, assessing archaeological artefacts, and measuring soil pollution. As of September 2017, one beamline is operational, a second one is scheduled to go live in November and two more over the next two years. Among the subjects likely to be studied in early experiments is pollution in the Jordan River valley with a view to improving public health in the area, as well as studies aimed at identifying new drugs for cancer therapy, and cultural heritage studies ranging from bioarcheology to investigations of ancient manuscripts. As SESAME’s particle accelerator enters production phase, it is expected to produce thousands of gigabytes every day which will be transferred to HPC centres in and outside the region for analysis, including partners in the EU-funded Virtual Research Environment Vi-SEEM project which supports research communities in Southeast Europe and the Eastern Mediterranean in need of networking and computational resources to further interdisciplinary collaboration in the fields of Life Sciences, Climatology and Digital Cultural Heritage. To tackle this data deluge, the Arab States Research and Education Network ASREN is providing SESAME with high-speed connectivity and access to the global R&E network fabric via a dedicated link from Amman, Jordan, to the ASREN PoP in London. Initially at 50 Mbps, the link capacity was doubled in September 2017 as part of an agreement between ASREN and JUNet, the Jordanian University Network which has now also been re-connected to the global NREN infrastructure thanks to the EU-funded EUMEDCONNECT3 project.